Please post questions in either the thread above (preferred) or in here. Please do not PM me questions about the axles themselves. If you can post it here, it will help others and help me not answer the same question over and over. * .200 narrower from hex to hex than a Berg. Now you can keep a decent amount of scrub and not have to be over 11" wide. They are the perfect width! * Even though they are light, there is no sacrifice in strength. Hold on to the trigger with confidence. * Much better clearance than a Berg at the locker. * Front motor is moved back. No need to notch the tube for 86Jeep style steering and the servo can finally breathe giving the servo a much longer life. * Unlike the Berg, these cases are ready to go with out all the work. 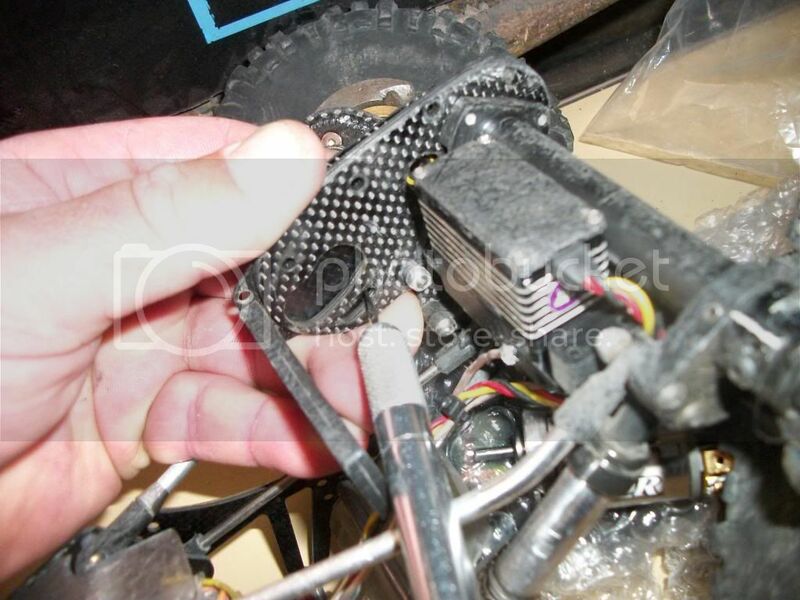 No need to shave the case, mill the motor mount down, move the motor mounting locations etc,. These setup fast and perfect. 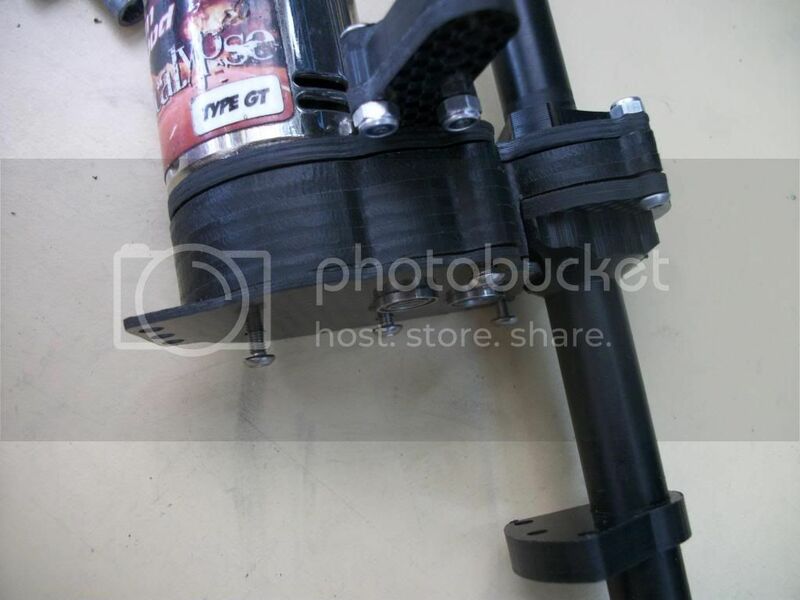 * With the servo moved back you can now achieve perfect steering angles and also place the entire tie rod behind the tubes for a perfect approach angle. 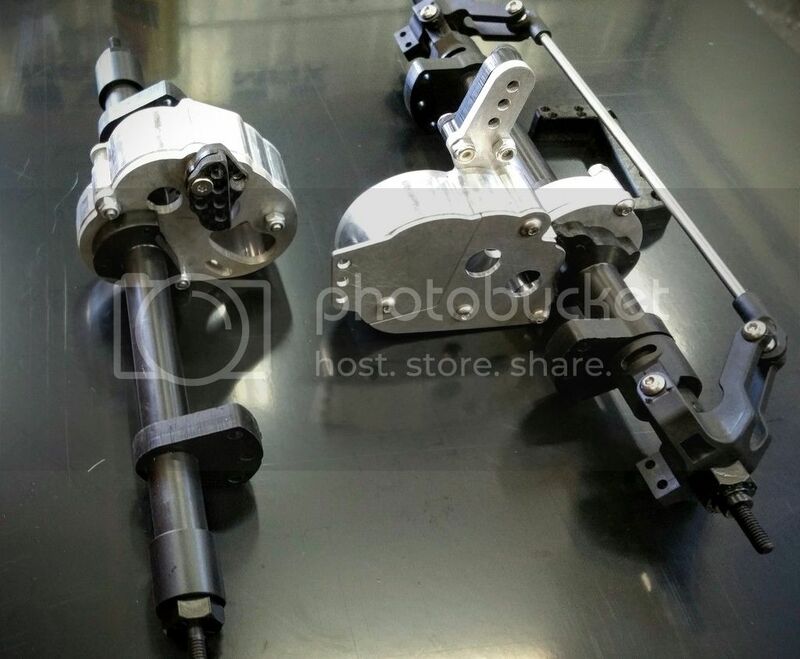 These axles had some refinements in order to bring the price down. I was able to drop the price 33%! Youre getting the lightest set of axles manufactured, bar none. These are .200 narrower. Much better clearance in the front and this also gives you a better overall width. Double check others before you buy and you will see that these features are unique and offer huge advantages over the competitors. These things might be a bit intimidating at first. Remember, this is a new idea for you so there is probably going to be some learning curve to it. I tell people that putting these together for the first time is a bit like putting my beadlocks together for the first time. 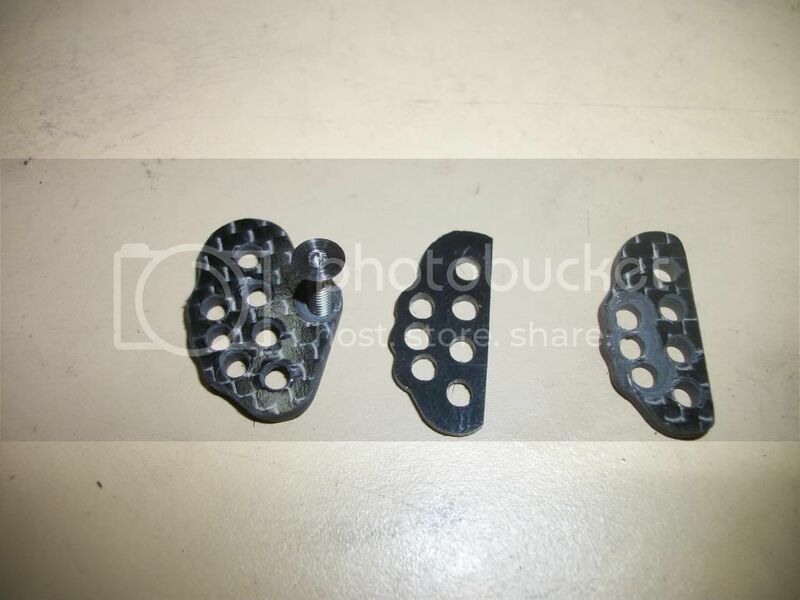 They are VERY different than the typical beadlock but once you do one, you will probably like putting them together more than the typical beadlock. These gear cases are no different. All my testers and I were a bit confused at first but once you get them together for the first time, you will wonder why you even had a concern. Go into the project with some patience. 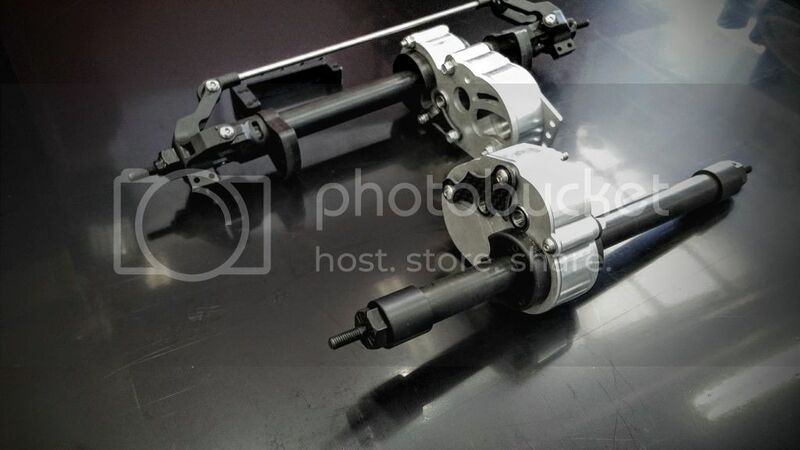 The hardware used on these axles are of premium quality. There is a mixture of aluminum and grade 5 titanium (not cheap grade 2 like most TI screws) Some screws cost as much as $3 each so take care of them! Use a good driver when assembling the cases. The front and the rear will be the same basic install so I will just go over the front and then you can do the same on the rear. The only thing that is significantly different on the rear is the upper mount. I will go over both of those. Start off with the motor side CF. Install your long side tube (rear has a lockout, front does not) onto the motor side CF. All 4 of the tubes supplied have different mounting holes. You cannot put the wrong tube on, however, you need to watch because they holes in the tubes are not symmetrical. If the holes do not line up and you know you have the correct tube, you will need to turn the tube until they do line up. Install the long side tube with a M3 x 8 FLAT HEAD SCREW. The flat head screw will fit into the countersinks on the CF. 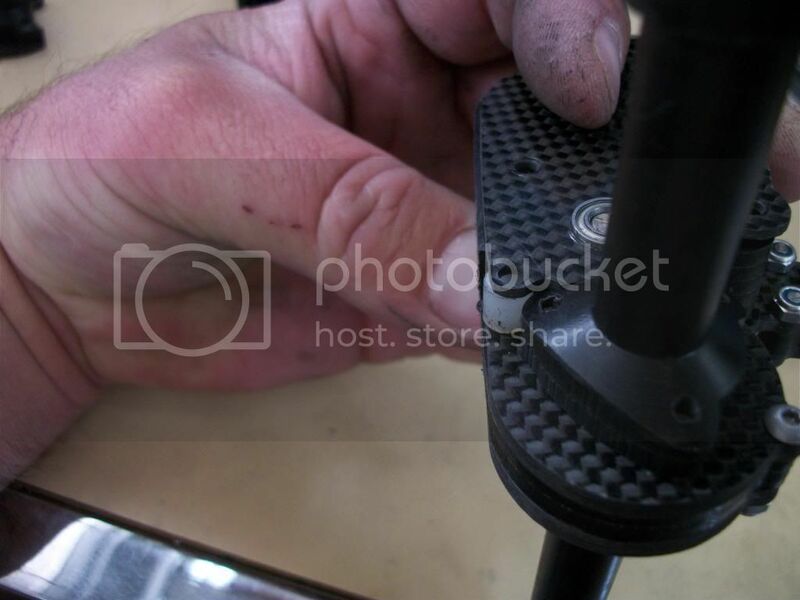 If you dont use a flat head screw the head of the screws will bind on the 4th gear. Now assemble the upper link mount. 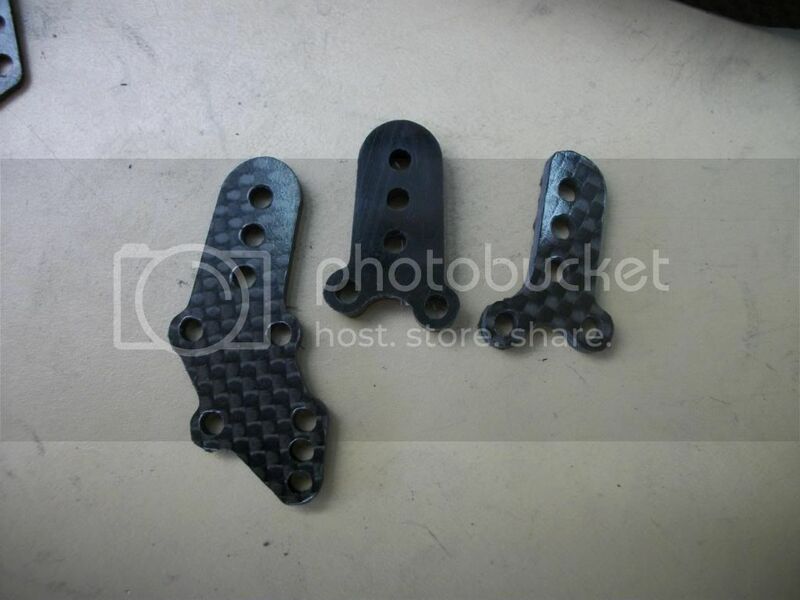 In the picture shown below are the 3 pieces you will need for the upper mount. The order will go: big CF, middle delrin, small CF. Note that the small CF piece has a cut right next to the link holes. 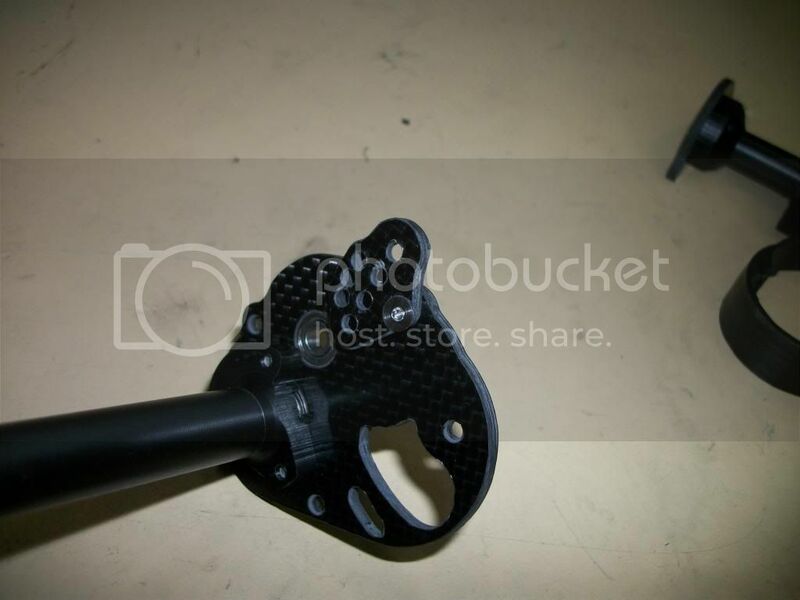 This is so the rod end will clear the mount. 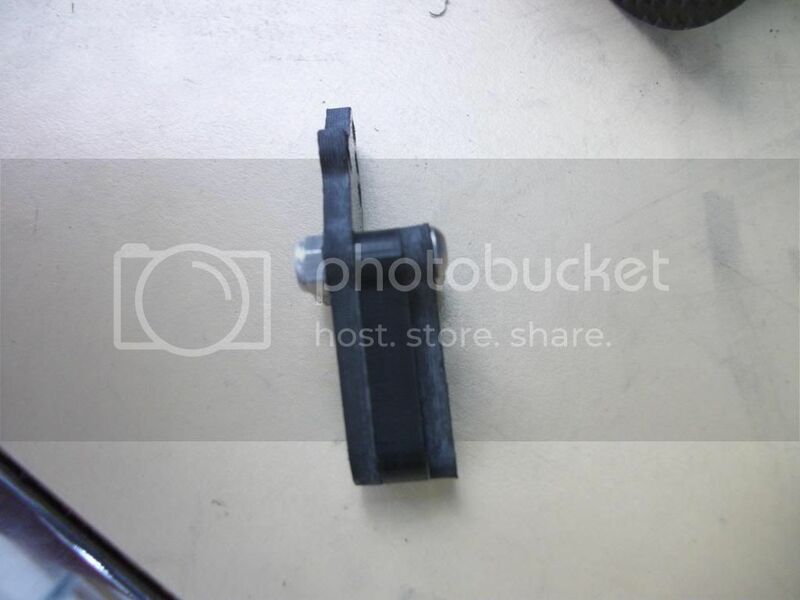 Use 2 - M3 x 14 Button head AL screws to assemble all 3 pieces together like the picture below. 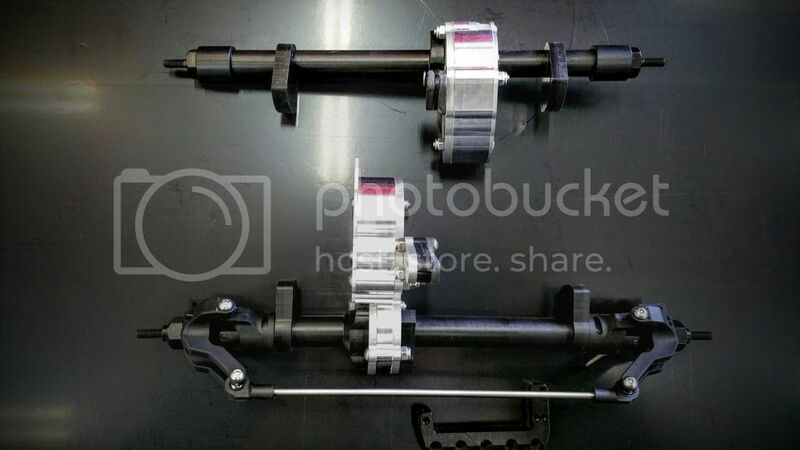 In the picture shown below are the 3 pieces you will need for the upper mount. The order will go: big CF, middle delrin, small CF. 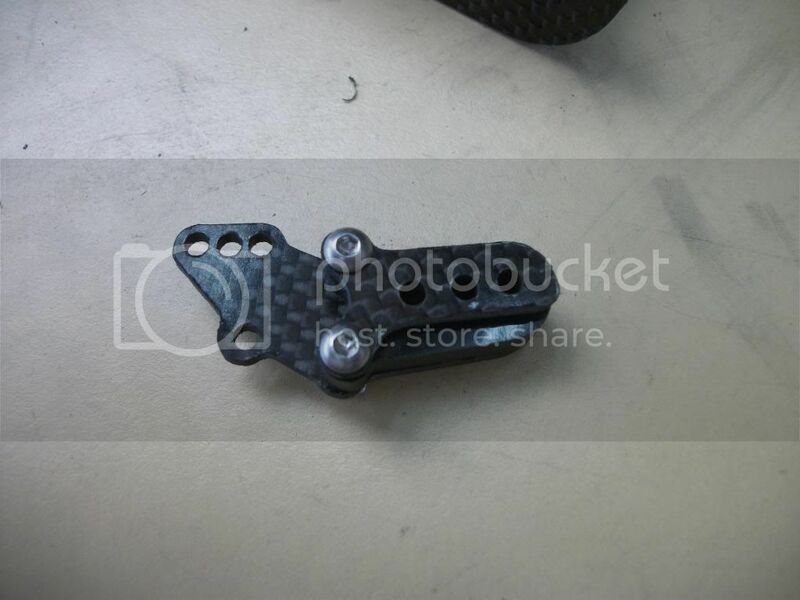 Note that the small CF piece has a cut right next to the link holes. 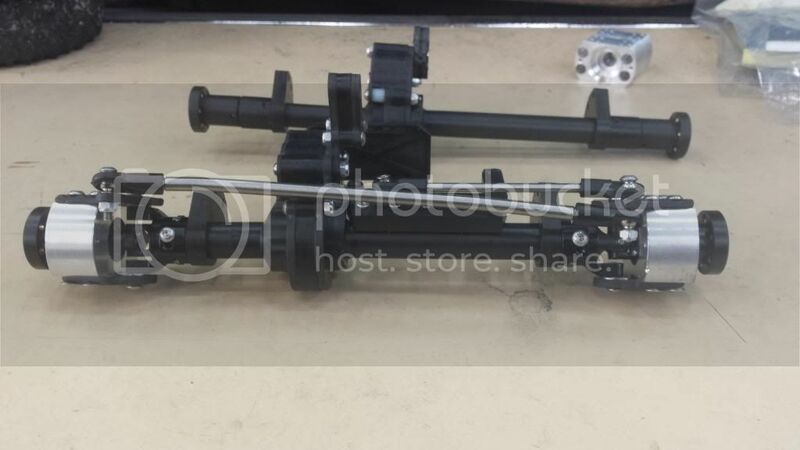 This is so the rod end will clear the mount. In the picture below, it is exactly how it should look as you put it together. 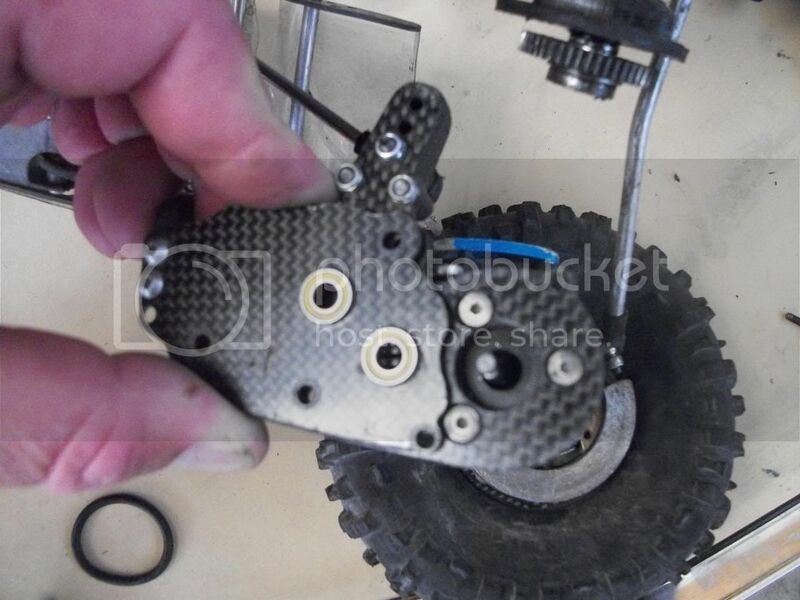 Mount your upper link to the motor side CF with a M3 x 10 TI screw. Snug this screw up pretty good. You want it to be tight enough that there is no slop but loose enough that you can rotate the mount. 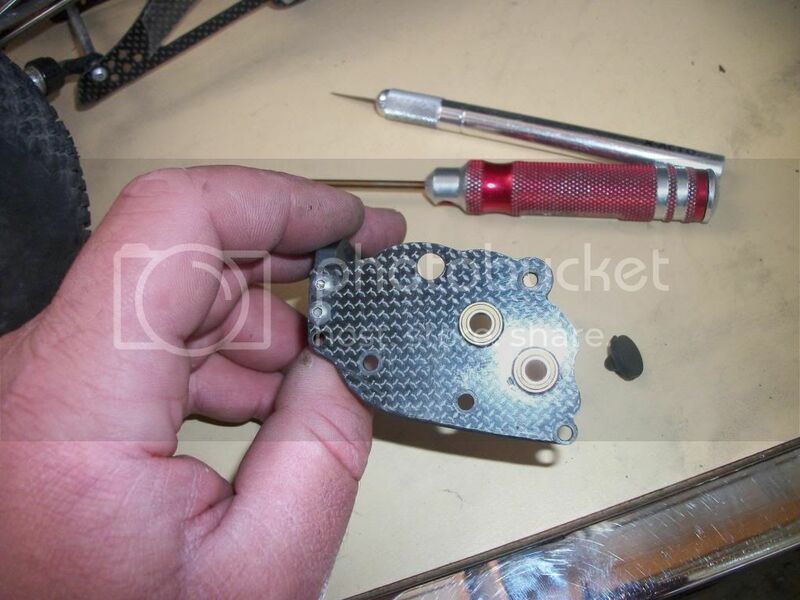 Install your motor onto the CF plate using a single M3 x 6 TI button head. You will want to put this screw into the adjustable slot, not the non adjustable slot. Install your 4th gear onto the locker using ample amounts of red loctite (you dont ever want these screws coming loose). Take notice that there is a long and short side to the locker. You will want the gear to slide on the short side. The short side is on the left in the picture. Install your gears on the motor side. There will be a 5x5x11 bearing that has a very shallow pocket. It may have fallen out during shipping as it just sits in there. 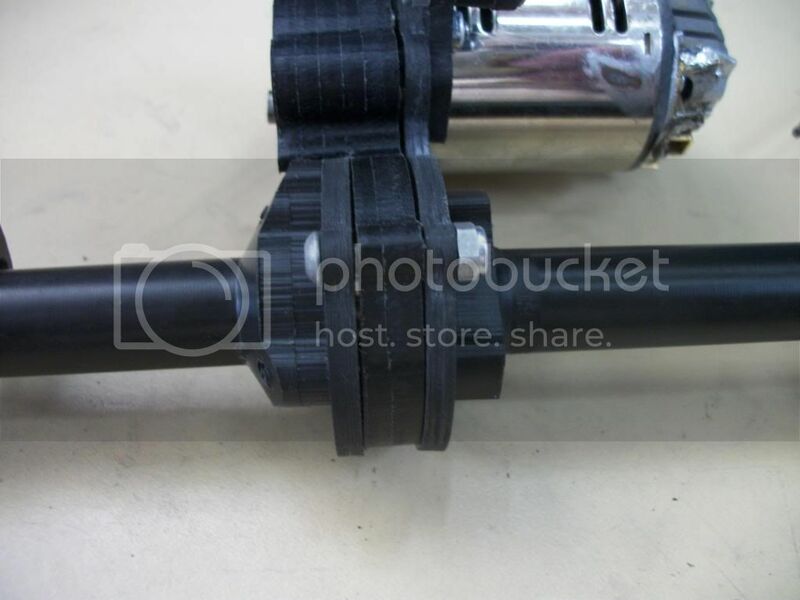 Install the non motor side, short CF piece onto the short side tube using M3 x 8 FLAT HEAD aluminum screws. Make sure the bearing is in the tube also. 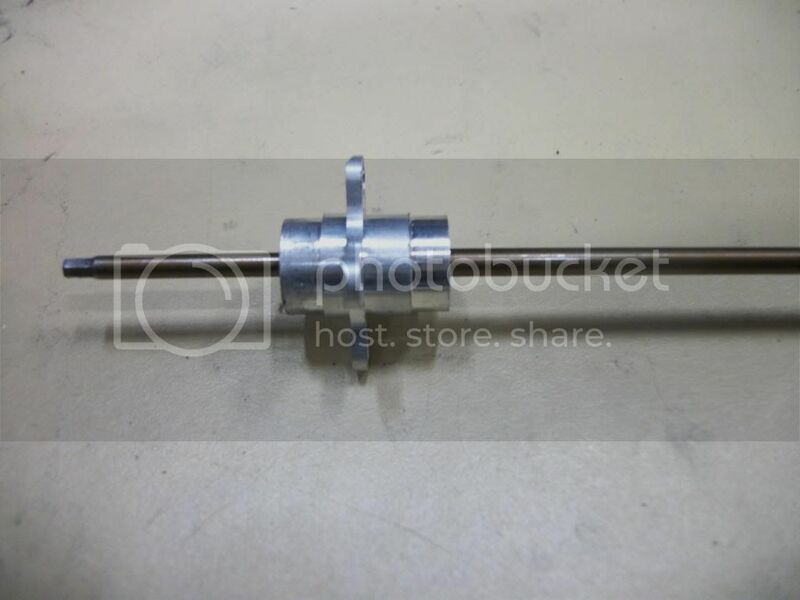 Install the short tube by using a M3 x 16 button head AL screw. Keep this screw somewhat loose so you can move the short side CF piece. 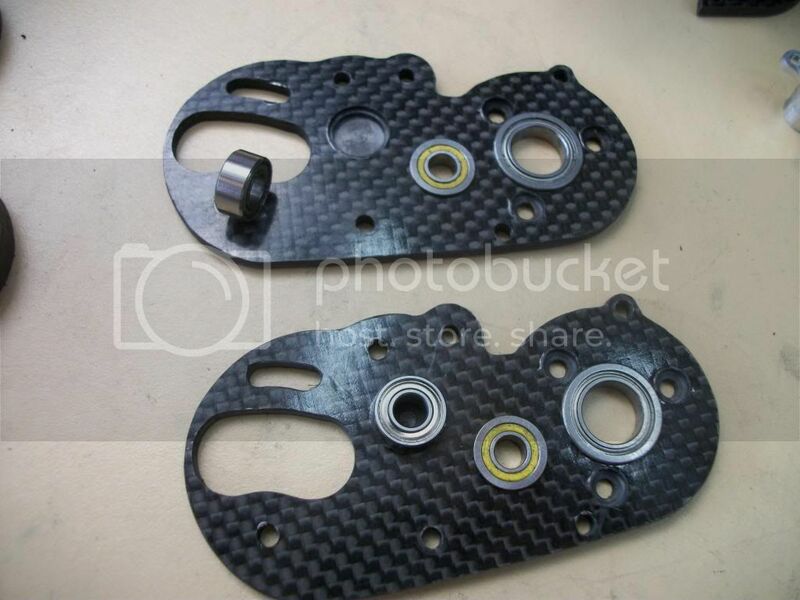 Install the non motor side CF with the bearings. 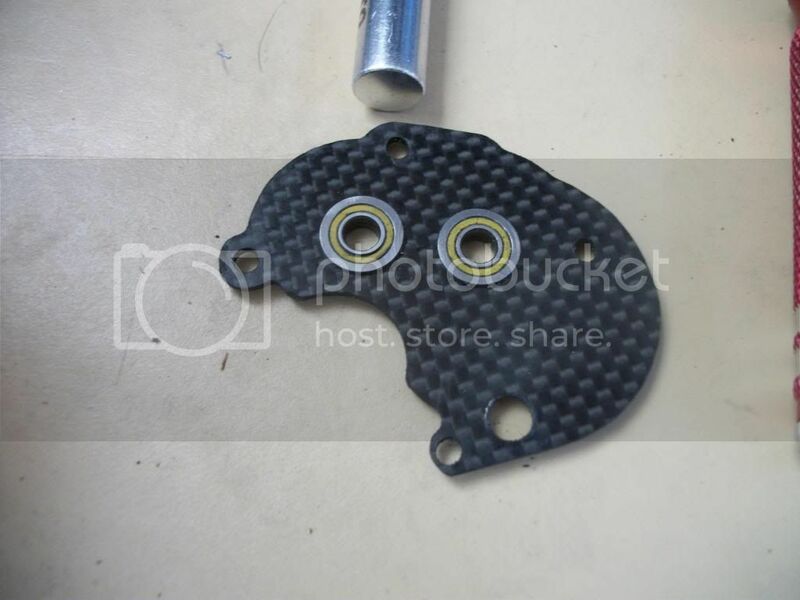 You will need 1 nylon spacer for the front, 2 for the rear axle. Line all the holes up and install M3 x 25 Button head TI screws into all the holes including the upper link mounts and the 2nd motor screw. There will be 4 screws in the front case, 3 for the rear. Tighten all the screws and youre done with assembling the case. I dont get crazy tightening the screws on the case. If you tighten too much you can smash the delrin center, affect the way the gears run and side load the bearings causing premature damage. Just a reasonably snug is fine. Adjusting mesh and installing the mounts, lockouts etc,. will be covered below. 1- M3 x 26 TI flat head to hold the upper link and go through the case. This screw is a hair short but I am limited by what is made. The option is to apply loc tite or run a steel screw. Front axles do not use the inner bearing. They are designed for use with Super 300s. 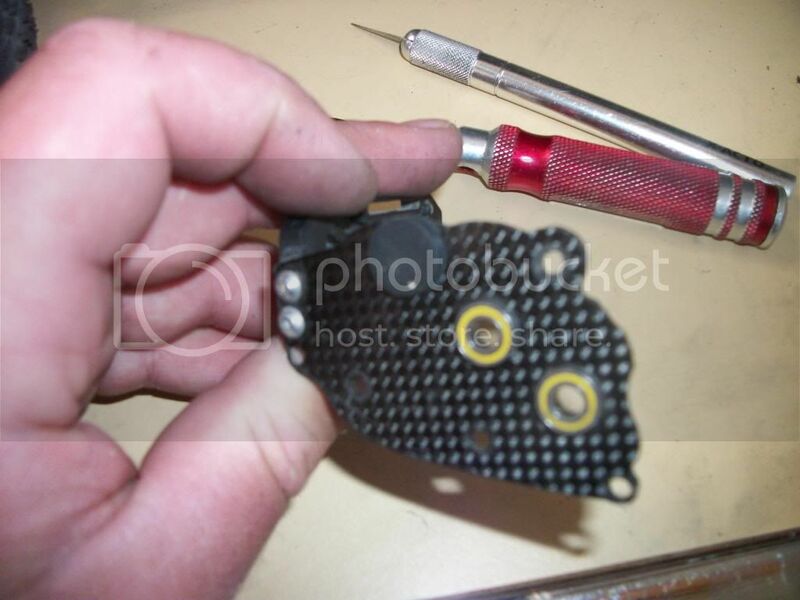 You will need to drill and tap holes for the set screws on all the parts. Everything will need 2 set screws 180* apart from each other except the rear weight holders, they are fine with 1 screw since they see no loads. On all the delrin I drilled it out smaller than suggested for a better bite. I used a #42 bit, a #40 is suggested normally. You will need a fresh good tap and drill bit. Delrin is not the strongest material and can strip easily when there is not much to grab onto (like the thin lockouts). There should be virtually no torque applied as you are just setting the screw into the plastic (and not tightening against something). Since every screw should be set in the part AND the tubes, it will hold. 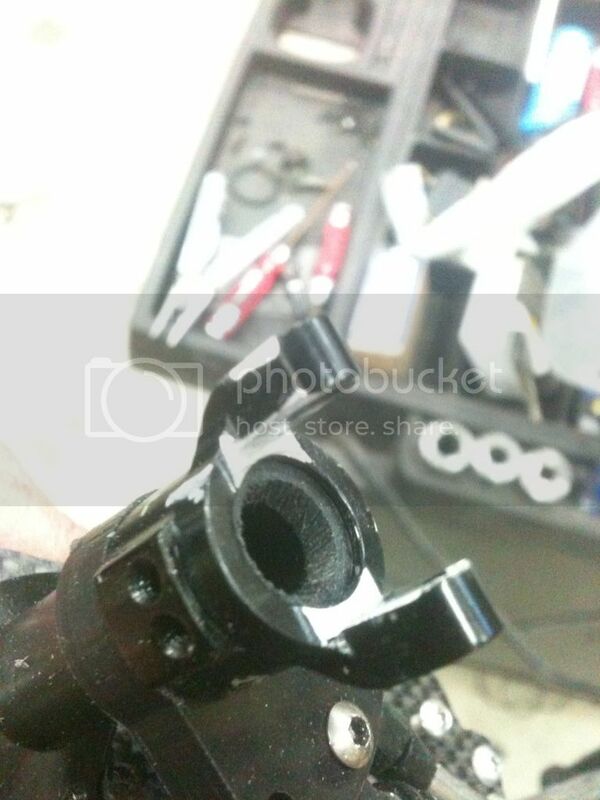 If you use the set screws I provided, inserting the screw until its flush with the top of the delrin is just fine. For the shock mounts, drill and tap where it starts to get thick, right where it ramps up and goes from the ring to the shock/link mounts. This gives a good spot for more material and is also a great spot because it is out of the link/shocks way and can easily be adjusted once installed. For the rear lockouts, you can simply push the lockout on until its tight against the bearing. On the long side tube, you will see where the lockout is supposed to go since the tube is turned down a touch more in that spot. On the short side, the tube is skinnier so it has the small diameter all the way. Push it on until the axle shaft has no in and out play. Drill through the lockout and into the axle housing. Its ok to go all the way through, you just dont want to put the set screw into the housing so far that it causes problems and rubs the axle shaft. 12mm bearings are included for the lockouts. The easiest way to get the bearing in is to put the bearing on the shaft and use some force and push it into the lockout. Its a tight fit. 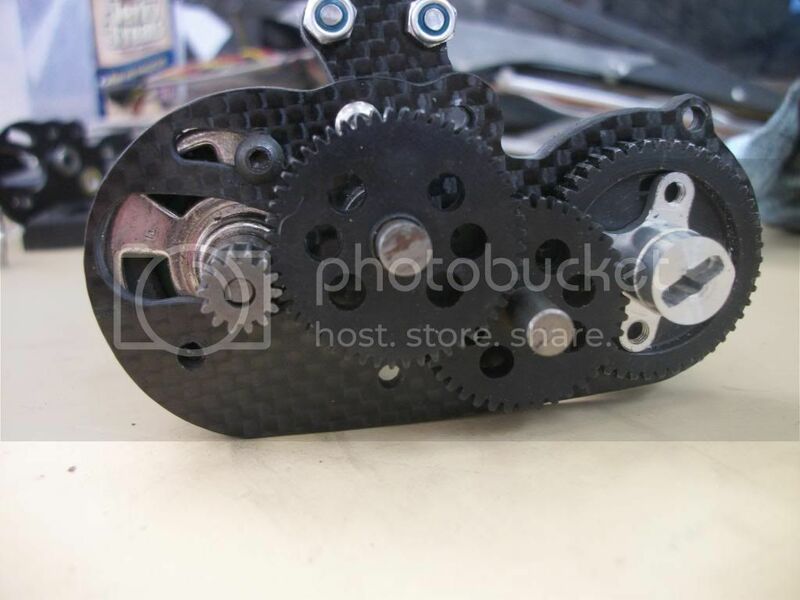 For the servo mount, the axle shaft has to be out of the housing. 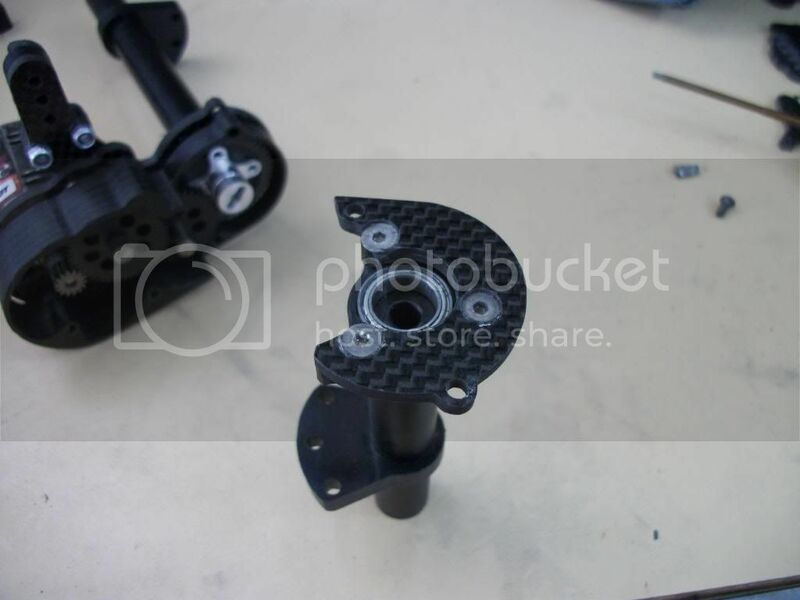 Install the servo in the mount and then you can hold the servo against the housing, choose 1 out of the 5 holes to drill it. I usually tap it just enough to start the screw and then let the screw do the rest of the tapping. Then put the screw in and snug it down. These will strip easily if you act like a gorilla. Seriously, they dont need to be tight at all, just snug. After you get the first screw in, drill and tap the next one. Do this one screw at a time. This will ensure that you can get all 5 screws in. If you were to drill all 5 and then tap all 5, you could be off a bit and it will really ruin your day. Once you have the screws in look down the axle tube. You should see that the 5 screws just barely poke through the Delrin. You want the entire screw to be threaded in the Delrin, not a thread short. You need to double check that the screws do not come through so far that the axle shaft will contact them. You can do this by gently putting the shaft in and turning it. If they are too long you may have to grind the screw down. If you do, make sure you chase the threads with a tap. Only use Aluminum screws. If you end up screwing this up or want an even stronger method, put some of the expanding brass inserts in. I have done this on mine and its brute strength! Its a bit more advanced though as the inserts you get from Mcmaster are a touch too long so they need to be shortened before inserting into the Delrin. I suggest running the screws in the Delrin as 99.9% will not have a problem. If you do have a problem, this is an awesome solution. On the C's, they will be seriously tight on the tube. Set your caster and then drill the hole in the existing threaded hole on the C and let the screw do the tapping. Then drill an additional hole on the top and bottom of the C so its captured on all four sides of the C.
When I first made these my testers and I simply eye balled the mesh before putting the non motor side CF on, assembled and then if the mesh didnt work out great, repeat. This got old really quick for me. You can still do it if you like a non modified CF piece and never plan on having to change mesh. I found the best way to set the mesh is not by sight but by sound. If you listen, you will hear range where the motor sits where it sounds really quiet and smooth. So it will go: really noisy (too tight), super quiet and smooth, then really noisey (too loose). I set mine as close to tight as possible but still have it quiet and smooth. 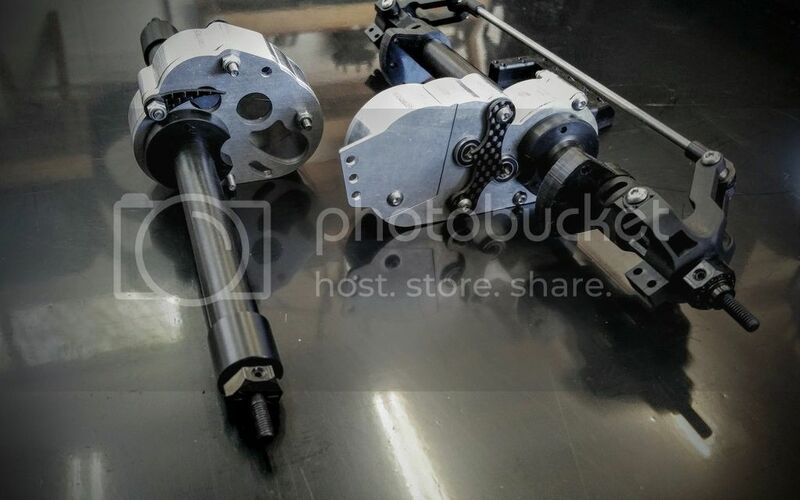 For a non modified CF piece, I would assemble the entire axle and leave both motor screws slightly loose. I would then turn my wheels by hand and move the motor in and out and listen. After getting sick of taking my cases apart so many times during testing and having to set the mesh each time I ended up drilling a hole in the non motor side CF where I can assemble everything and then access the adjustable screw from the outside. I would like to do this for each case but during testing we found many motor combos, pinion combos etc,. where the adjustable screw is in a different spot so this will be left up to the end user if so desired. 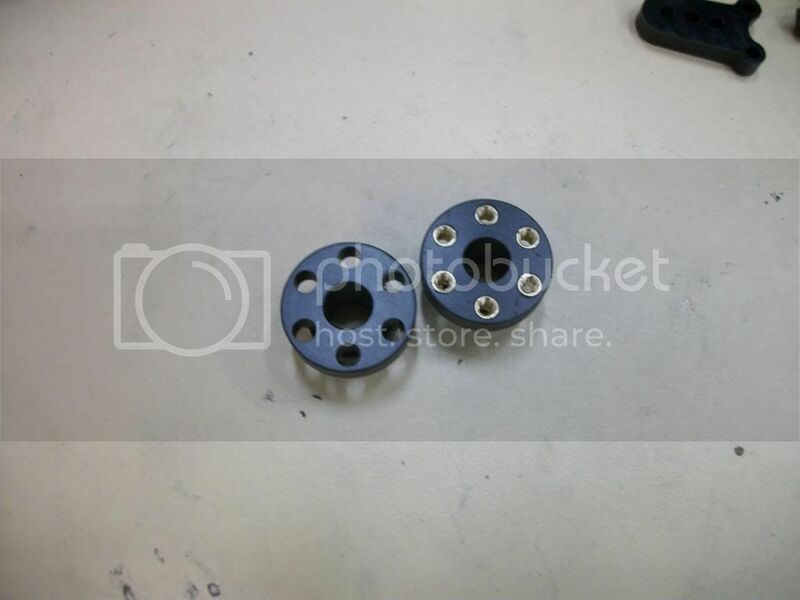 I included some rubber plugs in the hardware if you want to use those. Some testers didnt like the plugs but you can cover the hole with anything you like such as a sticker, tape, just about anything. I really like the plug since its re usable and I am weird and can see myself adjusting my mesh out in the middle of nowhere. Take the non motor side CF and lay it on top of the motor side CF just like it would be all assembled. Now I went to the back side where the motor would sit. I know where my screw sits when the mesh is close to proper. I marked this spot with an exato blade. Now drill the hole (13/64 or as close to .200 is what I found to be a good fit). Be careful to not get too close to the edge. 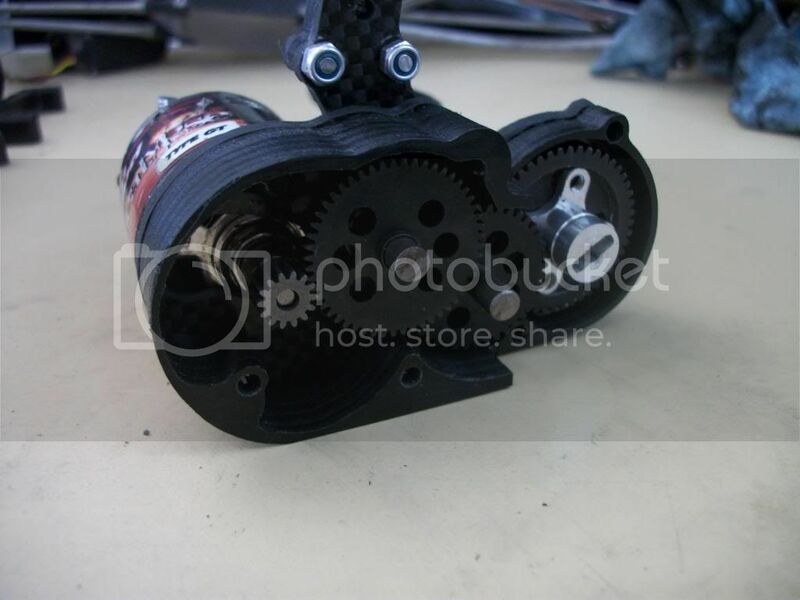 Assemble the case and now your motor is adjustable from the outside! 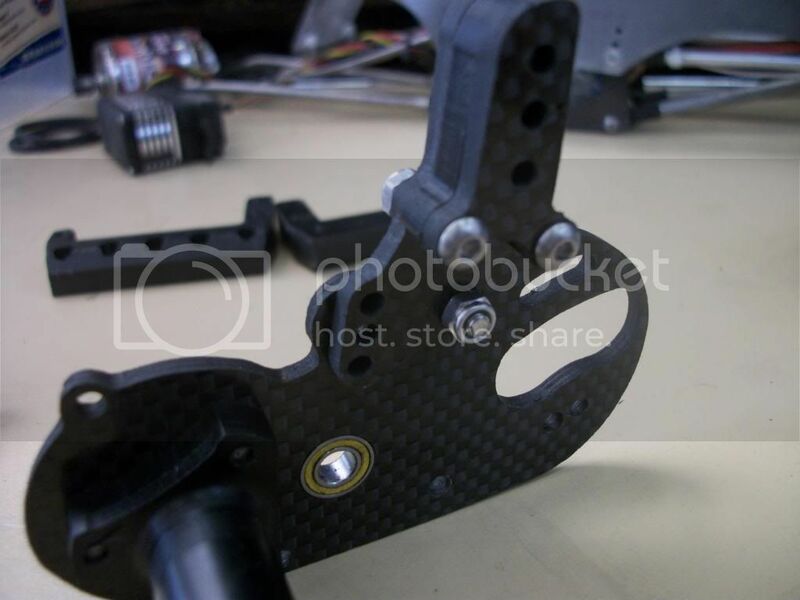 Delrin hubs are included with the axles. 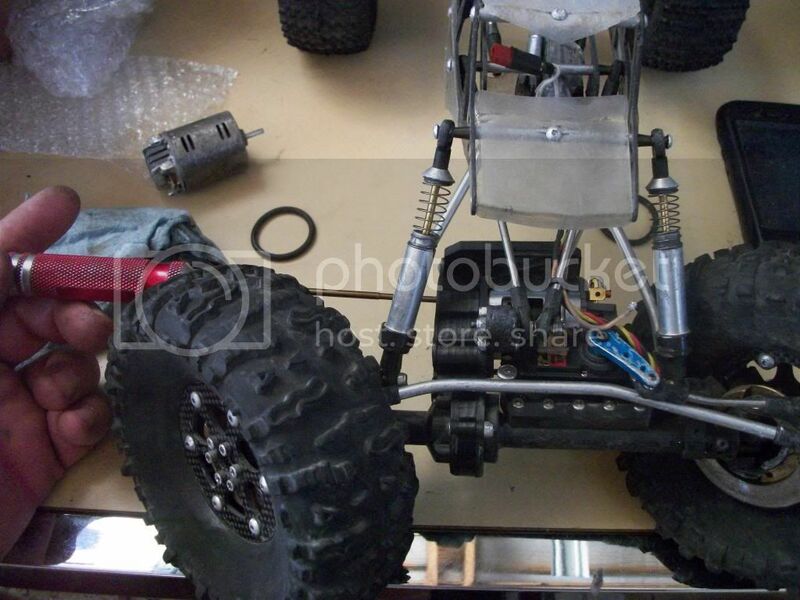 You can also use RC4wd aluminum hexes and a Vanquish style hub if desired. Using the delrin hubs will lose approx 1/2oz. The delrin hubs are not threaded. I suggest a 4-40 screw. M3 screws do not have the best thread pitch and can cause the delrin to strip really easily. I have had really good luck and a long life span using a 4-40 screw. If you want to use M3 screws or want a more bulletproof setup, you can use the brass inserts. If you want to go the brass insert route, you will need to drill the holes to .150. Do this in steps so you do not drill the bolt pattern off. When installing the new universal style shafts, you will need to do some mild grinding on the Axial hub and a slight taper to the delrin tube so that the shaft fits all the way in. If using the Bully knuckles that are milled out for 14mm bearings, put some red loc tite or CA glue on all 3 bearings. You dont need a lot just a drop on each one that are 180* from each other. Install just like you have it in the pic and press the bearings in as far as they will go against the shoulder of the shaft. This makes it so my axle shafts have no in and out play as soon as the loc tite cures. It makes for a really solid, slop free front end. 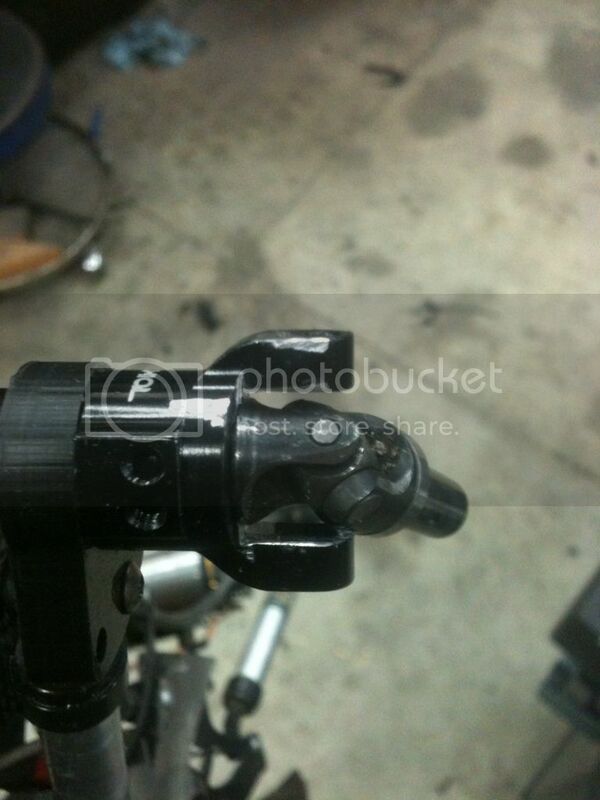 Also note that the bearing on the hex side will sit out side of the knuckle a bit. It will be even worse if you use a Bully shaft vs the Dlux shaft. On the Bully shafts you may not even be able to use all 3 bearings. If you dont like the bearing sitting out side of the knuckle or if youre running Bully style shafts you may not be able to run all 3 bearings. That is fine, just run 2. One on the inside pushed against the shoulder of the shaft and then 1 flush with the outside of the knuckle. Thanks Darren! I cant wait to get you your new car! That thing is going to be sweet! 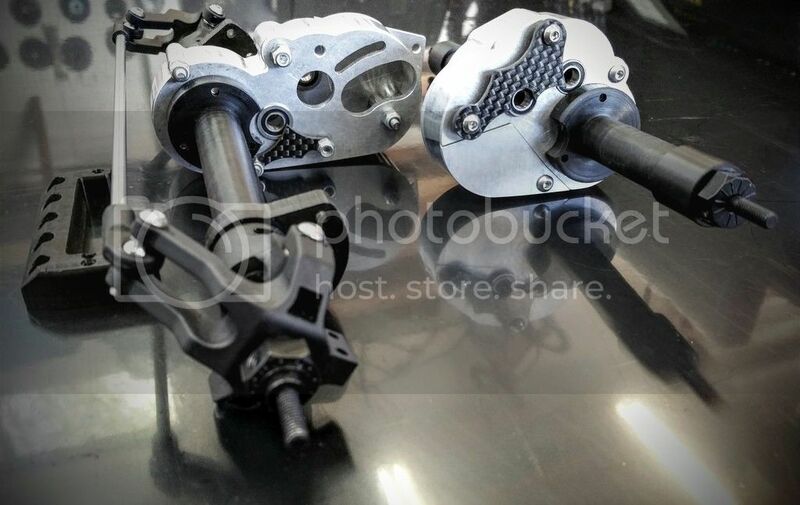 Very interested in these for next season and to support a great vendor"thumbsup"
Erik, are the bearings going to be your basic 440C/440C or 440C/Si3N4? The yellow seals pictured look like the latter"thumbsup"
Sweet! Glad to see progress Eric. It was cool seeing these first hand at WCS. I wish I wasn't judging so much so I could of checked them out a little closer. I'll be watching for updates. "thumbsup"
These look great! 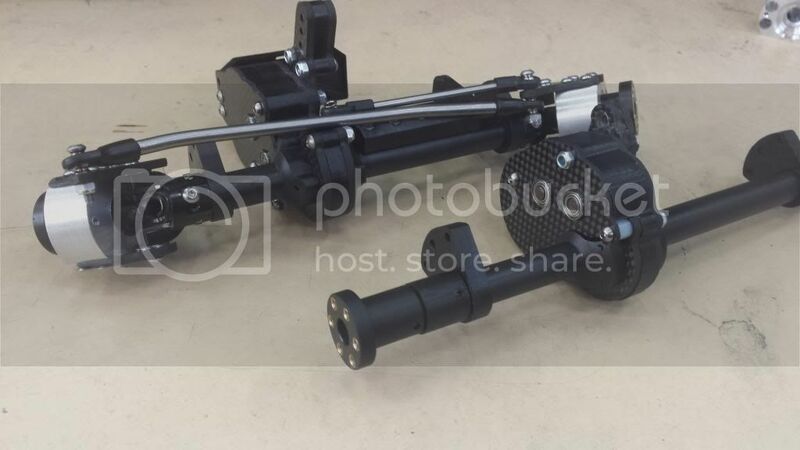 Ok, for someone like me that is currently running your entire old setup with the tubes, shock mounts, and aluminum rear axel, what will carry over and how will that effect the price? Unless youre running the big tang rear shafts, nothing will transfer over other than the front end parts that I am not including anyhow. I'm shaking the change outta my beard as we speak.... This are sick Erik! Ill see ya in Az "thumbsup"